Tony’s path as a self-taught artist has followed a serious and active course that has been dedicated to a single medium – watercolor – and an apprenticeship to its unique disciplines. 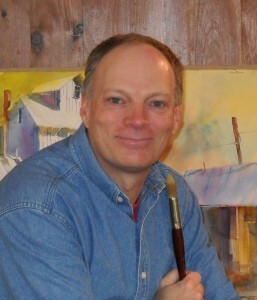 Tony’s paintings are widely exhibited in juried, group and solo exhibits. His work has been included in a number of national juried exhibits including the New England Watercolor Society National Biennial, Adirondacks National Exhibition of American Watercolors, and the Hudson Valley Art Association Annual National Exhibition, among others. Tony is a Signature Member of both the New England and Vermont Watercolor Societies and an active member of several other watercolor and art societies and an Artist Member of the Salmagundi Club. He is profiled in “100 Artists of New England”, Schiffer Publishing, 2011, “Best of Artists’ – American Landscape”, Kennedy Publishing, 2012, and in “Three Who Nurture The Arts”, Southern Vermont Arts & Living Magazine, Summer 2013 and “Learn From What Isnt’ Working”, Plein Air Magazine Aug/Sep 2015. What attracts me to a particular scene has to do with the pattern of individual objects, contrasts of color, value, or intensity and, most of all, the quality of light at a particular moment. My senses are particularly in tune with time as it passes through the cycle of seasons and how a particular moment in time is reflected in the character of the landscape. Times of transition – especially those transitions from season to season – are especially captivating, since the landscape reflects change with subtle contrasts. The main objective of much of my work is to freeze moments of transition, revealing the evocative character of common subjects. Watercolor is my main medium of choice. It is truly the medium of light since much of its beauty and character result from the interaction of transparent color and the light that passes through, from paper to eye.